I’ve been in London for the past week and was surprised to see that the Daring Book for Girls (the afterthought girls’ version of The Dangerous Book for Boys) seems to have spawned countless imitators. When I return home I will upload a photograph I took of an entire three-level shelf of the children’s section in Foyle’s Books dedicated to these nostalgic books that seem to borrow their covers from late-Victorian books and magazines like The Girl’s (and Boy's) Own Paper. In addition to the UK version of the original US edition of the Daring Book (which looked substantially different in content), was The Glorious Book for Girls. While I had heard of this one, I was amazed to see the numerous smaller, derivative books. A search on Amazon reveals there is even a new book in this style pertaining to dogs. 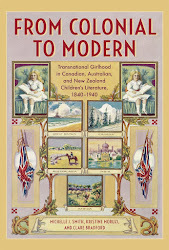 What surprised me most was seeing that The Girl’s Empire, a publication from the turn of the century, has been reprinted in a new edition (2007). There seems to be phenomenal interest in nostalgic books about childhood. An entire book display at Fortnum and Mason (perhaps not a real reflection of what is being read by children) devoted to boys’ books included Camping for Boys and numerous other titles that took material for children’s books and magazines from between fifty and one hundred years ago. I’m presuming it’s well-meaning adults buying these titles for children, or even, perhaps, for themselves. Nevertheless, I'm keen to make more of this upsurge in interest when I return home. I'm hoping there's not just a simple answer like that this is cheap, out-of-copyright fare to reprint.